75236 Duel on Starkiller Base revealed! 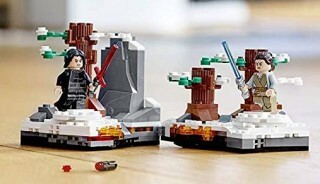 Amazon.it has published a couple of 'lifestyle' images showing 75236 Duel on Starkiller Base. This set is based upon the climactic lightsaber duel during Star Wars: The Force Awakens so features Rey and Kylo Ren minifigures. Moreover, the set contains 191 pieces so may cost around £19.99, $19.99 or 19.99€, although comparable Star Wars sets have featured higher prices recently. The functions include two rotating platforms for the duelists and a hinged base that recreates the shattering crust of Starkiller Base from the movie. Are you looking forward to this set? Let us know in the comments. It looks like a poor MOC, but a pretty good parts pack. Maybe something to consider on sale. Nice looking little set. They went for a very small percentage of Starkiller Base in favour of much detail, but why on Earth (or on Starkiller Base for that matter) they incorporated that stud shooter gun instead of Rey's handgun is beyond me. wait, WHAT!!!!!!!!!!!!!!! is that a stud shooter!?!?!!?? well, that's underwhelming...but then again, having seen the leaked price a while ago, I don't know what I expected. LEGO SW continues to disappoint in 2019 as well.. They're both stood on round platforms. That could be a manual feature like on the Praetorian Guard pack, or could be a nice geared play feature to simulate a duel. Two of the ST's biggest characters, for a lower price, and with cool play features. Children are going to love it, and let's PLEASE keep in mind that they are the main audience, not the AFOLs who obsess over cent-per-piece or whatever. Much smaller than I thought. MUCH. Yes the other sets in this series are $25, but damn this is small. Remember Ahch-to island and Yoda's Hut, weren't they $25/30 sets, better value. this should've fit that category. Rats, I was really hoping for a recolour of Lucy's scarf/hood/cowl from the TLM2 sets on Kylo Ren. Or dual-moulded arms on Rey. I still like it though, the breaking apart bit is very neat. Bare hands on Kylo Ren? For two iconic characters, I was not expecting the set to be so small. Tempting, but sadly I was very disappointed with The Last Jedi, so I'll avoid this. Instead I would've preferred a similar set of any of the lightsaber duels from the original trilogy, like the Dark Side Cave on Dagobah for example. This set does gives me hope that I'll see more of the same from this theme. I'm pretty happy with the look of this. I like that they went for detail over size. Plus, I still don't have a Kylo Ren minifigure! What an odd little set. Correction. What a weirdly-expensive odd little set. Please be $9.99 or $14.99. $19.99 is way to much for 191 pieces. Nope! This is horrendous. It’s the unwanted step-step-step-step sibling of Duel on Naboo. Why didn’t they make a proper Starkiller Base in the second or third Force Awakens wave? Instead we got an unwanted re-release of The Death Star. A proper UCS / MBS of Starkiller would have sold then, Pre-Rogue One. Imagine the set: inside the base, the hologram room, torture chamber, catwalk, shield generator AND outside the base... proper forest due, trench run, etc... Think of the possible minis - I’m thinking a big fig of hologram Snoke, full compliment of First Order troops, a wounded Finn, Kylo... it might have been amazing!!! But after The Last Jedi, very few would ever purchase a full-scale set. Shame! Oh, Sequel Trilogy? How about 'no'? The way you people are talking about the price, I assume it's not $20/€20 or lower? If it's more than that, I think it'll sit on the shelves waiting for a steep discount. I've seen ST Lego sets marked down 40% and more, which is very unusual around here. Apparently they want that trend to continue? It looks like a MOC made for a vignette contest on Eurobricks. Isn't there a watermark on that image? is it just me or has the sw theme been very uncharacteristically weak since betrayal at cloud city? Looks pretty good - although I wish Finn was included as well. So. much. whining on here. It’s a LEGO set, guys. If you dont like it, don’t buy it. @ronvining, Starkiller base isn't NEARLY as famous or popular as the Death Star, and we really didn't see much of it in the movie. Yeah, you saw the torture room, hologram room, etc., but those locations aren't iconic at all and nothing special. Lego instead chose to release the Death Star again, an iconic set that has received high praise and they know sells. I would have been all for some sort of base set that included the torture room and a few rooms, but I doubt it would sell well, especially since Starkiller is just a rebranded Death Star. I think you were expecting too much. @Psychic Tempest Zero, I wouldn't say their offerings have been weak. We have to remember, they need to keep a good handful of smaller sets out there. We can't have a ton of bigger expensive ships, otherwise you turn away a good portion of your market. As others have said, kids are a big factor with Star Wars especially, so having smaller sets like this out there is good. I'm not a huge fan of this set, but I also wouldn't expect much more from it. It's definitely gonna come down to price with this one. I love dioramas! Such a little thing but they managed to fit in a perfect function in relation to the source material and put two high demand characters somewhere cheap. Usually I hate when an entire line of SW sets is all $60+ so I don't know what you guys are complaining about, nice to see some little things. Now course, that's all said on the assumption that this'll be $20. Given SW's history they'll probably jack it up to $30. From my AFOL point of view it’s not very interesting. I have the figures already and could put some snow on the ewok village to make a better forest!! What did people expect for a set with 200 pieces? I've seen the overhead shot of it. It's with a hinge in the middle to open up, like you'll see the 'earthquake' splitting the ground and some lava in the middle. I believe also one of the tree is on a hinge clip piece to topple over and I believe the figs swivel there on the platform to have the duel. Jediinsider has another photo if anyone is interested. Not really for me, but maybe after the review down the road I might change my mind. Is this expected in April? I hate to sound like a downer here but with Disney's treatment of Star Wars I have slowly lost interest in the franchise altogether. So no, I am not excited about this, or any sequel trilogy sets for that matter. In fact, I think I would be happy to never see anything ever again that reminds me of episodes 7 or 8. Oh well, Duel on Starkiller Base is only a small set, unlike the larger 'Duel on' sets that are even more obviously over priced that stay on the shelves until clearance. If only Lego would ever release the same location in multiple sets at different price points, even with the same characters, but we all know that that will never happen. Huw, can we have the option to tag our own posts? I'd like to request a sarcasm tag. I fear that in not attempting to be one or the other, this set might fall slightly shy of both! There’s only so many Reys and Kylos you can have and i’ve already reached my limit so this set really isn’t aimed at me. Nice parts and low price minifigs for the casual fans though, particularly as Rey’s Speeder was a number of years ago. I don't have hardly anything from the sequel trilogy, and with some decent parts I would consider this on a sale. $20 for this? Man, i thought the Escape From The Death Star set was bad at $30. This is worse. This looks like something that would be given away at a convention as a raffle giveaway like at Comicon or something. Major letdown and for $20 I’ll steer clear. I think it’s a neat little display, I will get it and I’m certain for less than $20 at some point.